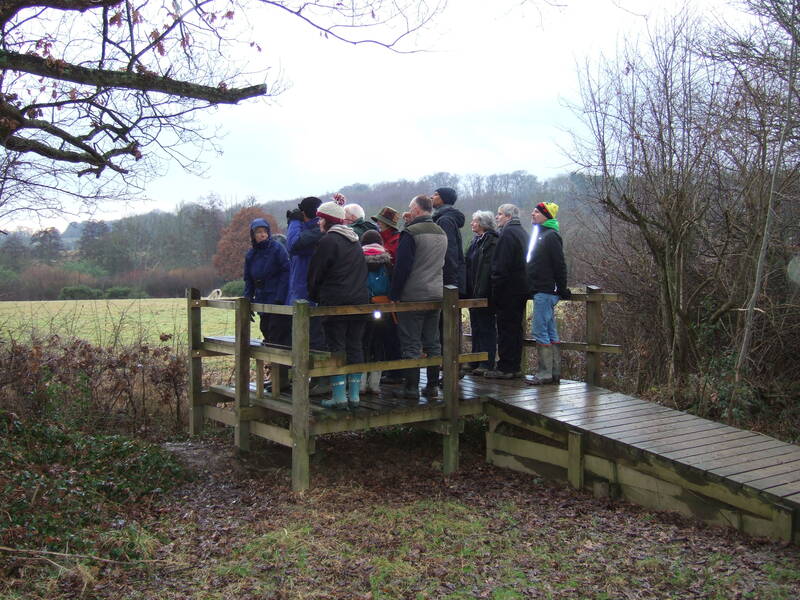 Here is the moment when one of the hardy groups on our FCF “winter wander” gathered on the Llama Lookout, observing a buzzard hunting. As Tim Thomas reports, “Back Field gave the pictured group an exciting moment as they watched a buzzard drop down onto a small mammal (probably a small rabbit) for a snack. It disappeared for a while only to appear shortly without the meal to fly to a perch low in an oak tree, providing fine views. It eventually gave up its snack, lazily flying off towards Denne Hill. “As we set off in two groups, fieldfares provided a chorus from The Orchard. As we moved further onto the farm, our group could see how resident blackbirds were supplemented by quite a few birds from the Continent. Luckily one or two of these winter migrants were around so the (very) small differences could be pointed out. Darker beak, occasionally more bulky, and some with longer wings – all features that are very difficult to discern as most of the time the birds are very active, in and out of the hedge bottoms. “In the open fields there was further excitement. A party of around 18 meadow pipits gave a show in Gravel Pit field: creeping along the ground feeding, only appearing above the grass to flit in their jerky, bouncing flight to their next feeding point.